OK sorry to double post, but I have to put this up as well. I'm not usually one to discuss national issues on this blog, but I think Knoxville has a chance here to be of some good use to our president/ fellow citizens. Here is my basic premise. If we are going to try Khalid Sheikh Mohammed (9/11 mastermind) in Federal Court, but don't want to try him near NYC I say we try him in Knoxville. We have a Federal Courthouse right here in downtown, we are far away from NYC, and we do not provide a high profile target for other terrorists. On a more selfish note, I would love for the Federal government to pump $100 million plus into Knoxville for this trial each year. Imagine how much business would be driven into downtown at a time where we could really use an influx of new patrons to support the new businesses and residences that are coming on line. Knoxville would benefit and the country would benefit, it's a win-win. I hope Bill Haslam (who is following the Wigshop on Twitter) sees this and pushes for it. Read on for the other post I wrote today, which is also time sensitive. Just saw this on Flory's Blog. I missed the meeting but emailed the guy. You can email him too at dmassey@cityofknoxville.org. Please email him if you would like to see bike lanes up and down Henley. Imagine how nice it would be to actually be able to ride your bike to Rally's to get a burger, or just truck straight through Summit Hill on your way to Old North. Let your voices be heard people and email this guy. Something you may not know about being a writer for the Wigshop is how glamorous it has made our lives. Everyday people are handing us concert tickets, picking up our tabs, or letting us jump to the front of lines at clubs. Our compensation does come from the joy of knowing that there are people out there that read this blog. (Quite frankly, I think you're all crazy, but) It is such a great feeling. However... it does not hurt for something more tangible to come our way every now and again. 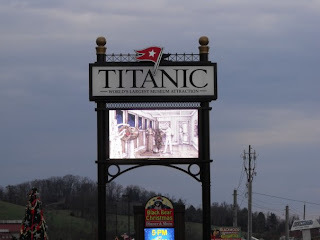 That's why when I was invited a few months ago to visit the Titanic replica in Pigeon Forge because I had written a post about it, I was ecstatic. It was a sentiment much like Rose must have felt while dancing with Jack and his fellow swashbucklers in the hull of the Titanic. It was a gray November day when I drove out to Pigeon Forge with two of my friends. 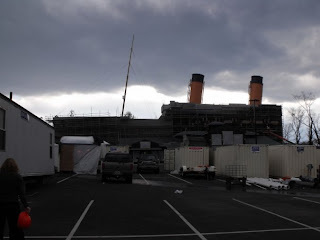 We passed the large upside down mansion, and there on our right stood the smokestacks. We parked and walked inside the black trailer in the parking lot to meet our tour guide, Rick. Upon entering, a jovial woman announced, rather startlingly, "Welcome aboard!" I pursed my lips to hold back laughter, mostly from sheer delight. Rick asked if we wanted to have the "Welcome aboard!" 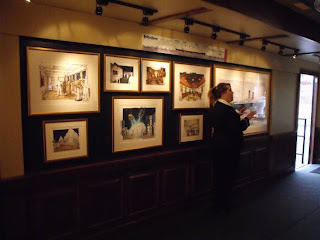 lady give us her spiel on the Titanic museum or if we wanted the tour first. I couldn't help myself. "The tour, please!" We entered the ship, donning orange construction hats. I have to say, it was a little disappointing. 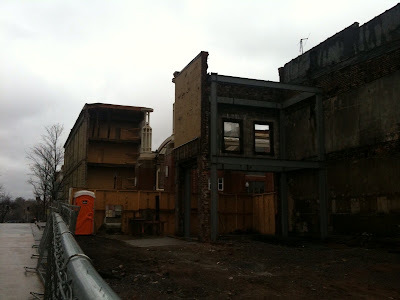 There was not much to see at this point but steel beams and concrete. Rick tried to paint images of its potential in our heads, of the Grand Staircase and the fine china place settings you would be able to touch in the dining room. I'm not one to give you all the details of the inner-workings of the museum: "The Titanic was constructed with 50 gabillion tons of steel, blah, blah, blah..." Rick did inform us that it will be as factual as possible, a place where adult and child can learn in an incredibly ornate atmosphere. I did retain such information as, there will be an ice wall that you can touch at the end of the tour in a room with a starry filled sky overhead. Also, you will be able to get married on the Grand Staircase, and there will be a reception room above for after the ceremony. What a dream! This spring, you too will have the chance to visit yourself, and it will cost you somewhere around $25. I can't wait to go back when it's all done, and you can be sure I'll be wearing (not a construction hat, but) my "Heart of the Ocean" necklace Rick gave me. There's been a growing movement in Knoxville that might surprise you- to raise chickens legally in one's backyard. Many of you might not realize that raising chickens is illegal in our town. Fewer of you might know that this doesn't deter many Knoxvillians from doing just that. Lo has pointed out at least three coops that you can see from his back patio. A co-worker tells me she wakes up to rooster crows down on Sevier Ave.
Now, with the "Urban Hen Coalition" some of our townsfolk are seeking to make what's already happening nice and legal-like. And, improbably, our leaders are listening and testing the water. Nick Pavlis, the District 1 councilman, has joined the interweb era and actually has a poll on his website asking whether or not hens should be allowed in the city. What do you think? 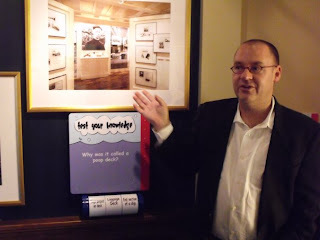 Go tell Pavlis at his fancy website. As for me, I'm gonna start shopping around for a head-chopping block for my backyard. As you may have read in the Metropulse this week, there is a plan underway to repair and expand the Henley St. bridge. Jack Neely did a great job so I'm not going to rehash the same stuff he said, or at least I'll try not to, but I am going to discuss my perspective on it. 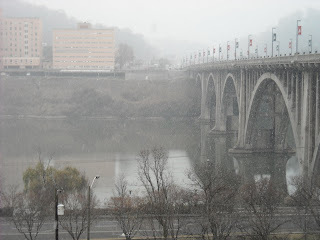 I live at the base of the Henley St. bridge, look out over it every morning and listen to the traffic on it every evening. the one consistent issue I notice is the speed with which people travel across that bridge. They treat the strip of road between Blount Ave. and Summit Hill like a drag strip. Speaking with my neighbor (Brian Pittman who was quoted in Neely's article) it came to light that very few people even know they have options when it comes to the coming construction. Knoxvillians aren't simply obligated to expand Henley into a 6 lane speedway. I want this post to be a bit of a forum for others thoughts about the entire future of Henley and what type of traffic situation we think would be most conducive to our community. I'll propose one idea. Having just come back from a trip to the British Isles I have once again come to appreciate the beauty of the round about. It keeps traffic moving smoothly while slowing drivers down considerably. I think Knoxville should install a roundabout at the intersection of Henley and Blount Ave. Just on the south end of the bridge. This would send drivers a signal that they are entering a residential, or at least mixed use, area and high speeds are not conducive there, plus it would ease the congestion that can arise during football games, rush hour, etc. Hopefully, we can begin to correct the tragedy of separating the campus and Fort Sanders from downtown and start to bring the feeder neighborhoods back into the fold. The city is moving in the right direction by encouraging TDOT to use bike lanes and more pedestrian. See the story HERE. I'm glad to be back from the long break, looking forward to 2010. Much Wigshop love to everyone. 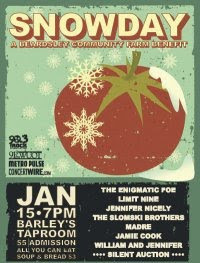 Tonight Beardsley Farm is hosting their second annual fundraiser "Snow Day" at Barley's in the Old City. It starts at 7 and there is a $5 cover. You can eat soup and bread for a mere $3 more. There will be bands, there will be beer, and there will be good people. You may go to their website to learn more about the work they do. I have yet to go visit them. I think I just made another new year's resolution. Also, if you know of ways in Knoxville to provide aid to earthquake victims in Haiti, please leave a comment on this post to share how we all can help. I know life doesn't stop here when disaster hits somewhere else, but I'm urging you (and mostly myself), to stop and consider all the ways we can be of service to them. I held out for a long time after B and I moved to Fourth and Gill before I made my first trip over to Three Rivers Market, the food co-op on Broadway. I was afraid of getting hooked on expensive organic and recycled products and being broke because of it. One day I was in desperate need of something -- lettuce or milk, probably -- and completely not in the mood to get in the car and head to the Fellini, so I walked over to the co-op. And yes, of course, I fell in love with it. But here's the secret it was keeping from me all along: the prices are hardly more expensive than going to Kroger. I wish more neighborhoods in more cities were blessed to have these kind of neighborhood markets that carry a full stock of your basic grocery items (milk, bread, fruits and veggies, toilet paper, snacks -- anything you might find yourself out of and in need of). I was surprised by how much variety is offered on some items. Sometimes I like to just walk up and down its three little aisles to look at all the wonderful things for sale and feel the creak of the wooden floor beneath my feat. I love that it's open until 9 p.m. daily, and the staff is super friendly. I love that I can walk there and back in under 15 minutes, although I won't be able to do that much longer. But what will be my loss will be everyone else's gain -- Three Rivers just announced its purchased the spot of what will be its new location sometime in the coming year. 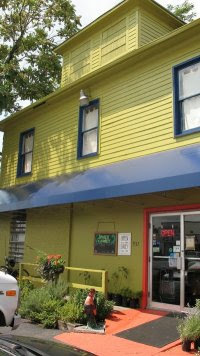 The market is moving a hop, skip and a jump away over to Happy Holler at 1100 N. Central St., one block away from Veg-O-Rama and Time Warp. Construction is to begin in the spring, and the good news for everyone else is this location will have much, much more accessible parking. So Fountain City, you can have your big, expansive brand-spanking-new Kroger (which I admit, has everything under the sun). I'll keep my Three Rivers Market, thank you very much. Happy New Year, all you lovely little Knoxvillians! You know how as soon as January 1 hits, those incessant fitness and diet commercials start up in full force? Annoying, isn't it? Yes, we ate cookies for a month straight, so what!?!? In the words of Chris Farley, "LAY OFF ME, I'M STARVING!!" In all seriousness, though, those commercials are out there for a reason. By and large, after the holiday "bulge," we do have some work to do. It's been a while, so I just wanted to remind you that the fabulous, local program Operation Boot Camp is out there for you! The new camp starts next Monday, so you still have time to sign up! It's a special 3 week INDOOR camp to help us all ease back into the routine (camps are usually 4 weeks long). Last month, WBIR's "Darin Erin" was brave enough to try it out. Check out her report and then head to the website to sign up (and get all the details)! You won't regret it!